Momma Told Me: Shop smart, eat well. Growing up my favorite time of the year was Summer. However, it is not for the reasons you might think; I had ample time to play with friends as neighbors just units away in the condominium complex, no, Summertime was all about spending time with my mom. Cheesy, I know, but she was one cool mother. Her continuous craft projects and adventures kept us busy from sundown to sun up; and my childhood marks the only period in my life where I'd actually spring out of bed, anxious to greet the day. One of our traditions I was especially found of were our Wednesday morning grocery shopping marathons. We'd spend the entire day before combing the mailer ads and matching coupons to sales. We were partners in crime against MSRP and the big wigs of grocery conglomerates! While dad worked long hours as a service technician, we'd often find ourselves out the door before even him, or the sun rose. While Momma was the very definition of an Extreme Couponer (and taught me everything she knows), her favorite grocery house was always Vons and it's Safeway affiliates. My local Vons location is a store I have visited since I was old enough to sit in the cart seat, and still bring my family to today. Grocery shopping is still very much a family activity for us, and once a week we sit down to organize our coupons and browse the week's Safeway ad for it's specials. Another tradition I've tried to make a part of my own family life is to celebrate the week's work with a fresh and healthy breakfast. These are especially important in fueling us for those early morning grocery runs! 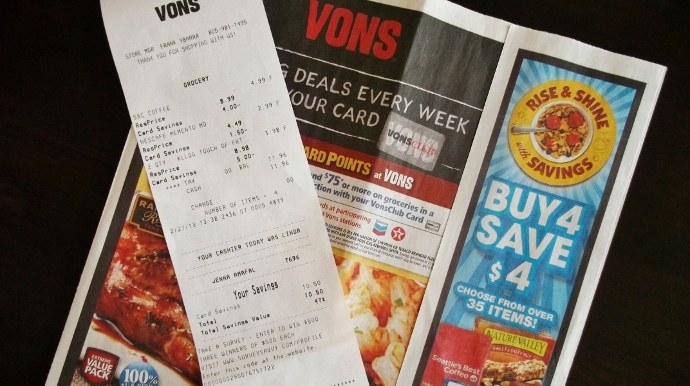 As it turns out, this week's Vons circular has a main banner promoting one of their more popular promotions, the Buy 4 Save $4 event, which features some wonderful name brands to create an everyday breakfast on a budget. Does it get any better than pairing a great deal with a great meal? So this week we packed up our coupons, and reusable canvas bags, and head out to take advantage of great #BreakfastSavings. Of course both the other half and I have Vons Club Membership cards, I've had mine since I turned 18; but we're also members of the new Just For U digital discount program. Every week we can log into our accounts online and add digital coupons directly to our store membership cards. This means we can stack coupons on top of already great weekly deals, like Buy 4 Save $4, and really cut our bill in half (or better)! Nowadays it seems so many mass merchandiser chains are trying to turn themselves into grocery stores, adding a fresh produce and bakery department. However, I still prefer the personal shopping experience of buying my groceries at a local that specializes in fresh and packaged foods. I can still take advantage of the convenient in house pharmacy to fill my prescriptions while I shop, but also enjoy benefits of a full bakery, catering department, service deli, and even Starbucks. Everyone in our family has a favorite department they must check out, and the other half always makes a point to stop by the Market Select section of our service deli for the day's fresh cooked ribs, wings, and even whole chickens! 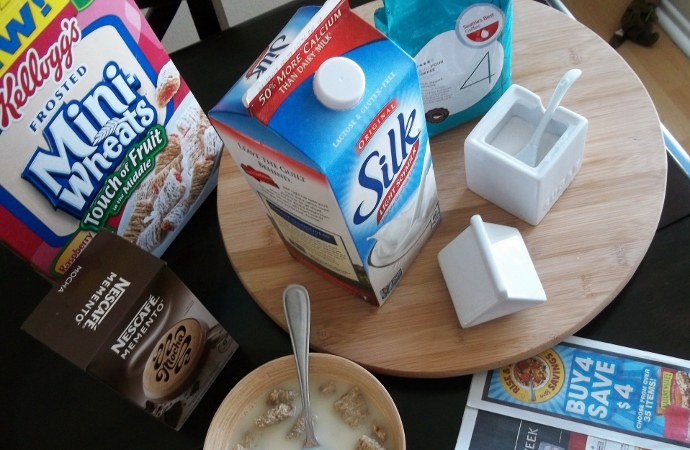 This week there were some excellent #BreakfastSavings on our family's everyday favorites like International Delight coffee creamer and Silk Soymilk (an everyday low price at $2.79). There were many wonderful cereal brands in the Buy 4 Save $4 promotion (which covers 35 products in total), including 8 flavors of Frosted Mini-Wheats. We picked up a box of Sabrina's favorite flavor, the Touch of Fruit Raspberry, which have real raspberry fruit filling wrapped inside while grain wheat, with a hint of sugar frosting. She's never had Original Silk with her cereal before but was quick to let us know that "this milk is really good!" I was pleased to know, even though she'd opted to eat cereal for breakfast, she was getting a balanced meal with nutrient enriched soy milk. Catch some more behind the scene shots of our shopping trip and meal in our Google+ album. The adults, Jeremy and I, each got to pick out our favorite at home coffee beverages, Seattle's Best Ground Coffee and NESCAFE Memento Mocha, as both were part of the Rise and Shine Buy 4 Save $4 Savings Event! I was surprised to find so many major brand coffee varieties, including instant sticks, ground packages, and even K-Cups included in the savings promotion. No matter how you prepare your morning brew, there's a great deal to be found, and these deals can be expanded even further when you use some savvy shopping and add coupons! 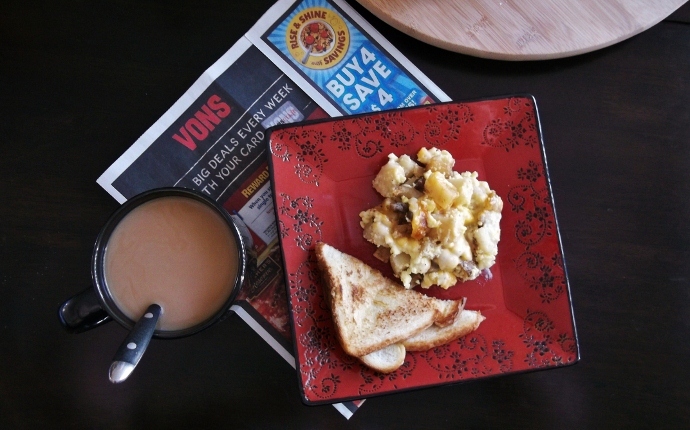 Using my Silk Soymilk as creamer, I paired my fresh brewed cup of coffee with a Marie Calender's Breakfast Bake of Sausage, Potatoes and Cheese. All that was needed for this simple, and affordable meal was a freshly toasted slice of bread and half an orange. PS. There are some great savings to be had in the Frozen Foods Stock Up sale going on this week as well. I received $5 off my next order when I purchased $20 in participating items. Not only do we have fresh breakfast essentials, but I stocked up on school morning favorites like Pillsbury Toaster Strudel too! I'm thankful my family loves to share in treasured traditions of grocery shopping together, and that we can all gather round the table for an affordable everyday breakfast, thanks to smart savings like the Vons Buy 4 Save $4 promotion. Clipping coupons can be overwhelming and time consuming for many parents and business professionals, easy and quick savings promotions like this can truly pass on the savings without the time. And for those of us who can tackle couponing, it just enhances the value and extends our family's budget, so we can indulge again elsewhere. Be sure to keep an eye out at your local Safeway affiliate for the Buy 4 Save $4 event tags on participating items throughout the store. There are many great Kellog's brands participating in the event, and I'd love it if you could support the brand's Share Breakfast initiative here. Just one social media action will feed a kid in need! Don't waste time though, these promotions will only be valid for a limited time! 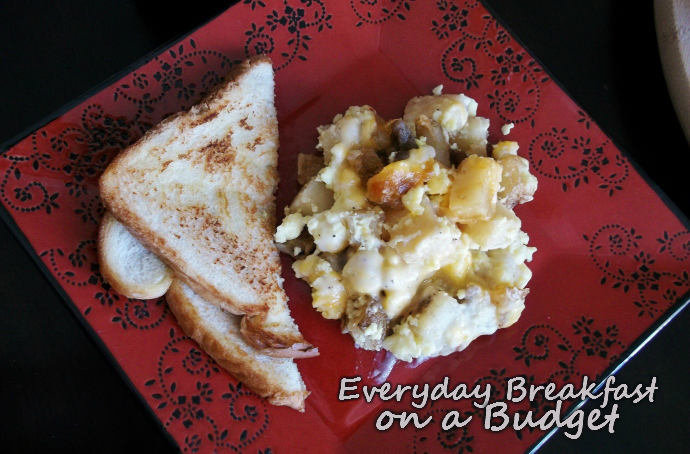 Does your family have any treasured breakfast traditions? Do you shop together or solo? 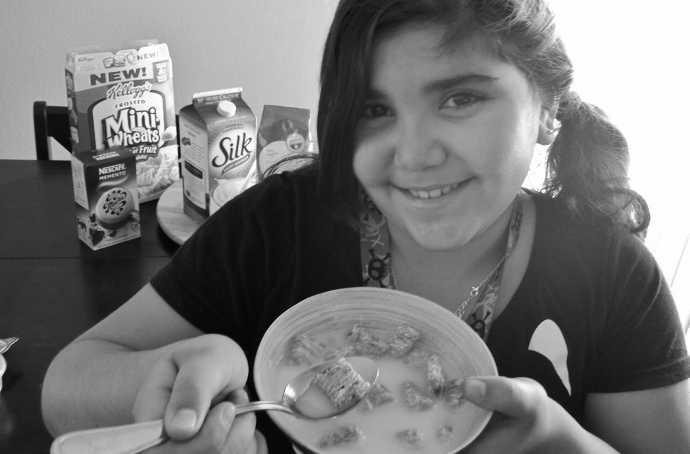 What Daughter Says: Sometimes a simple and nutritious breakfast is all it takes to bring the family together. I am a member of the Collective Bias® Social Fabric® Community. This shop has been compensated as part of a social shopper insights study for Collective Bias® and Safeway #cbias #SocialFabric. I think one can see how Von's provides wonderful deals to make your breakfast full of smiles like Sabrinas! That red plate is gorgeous! 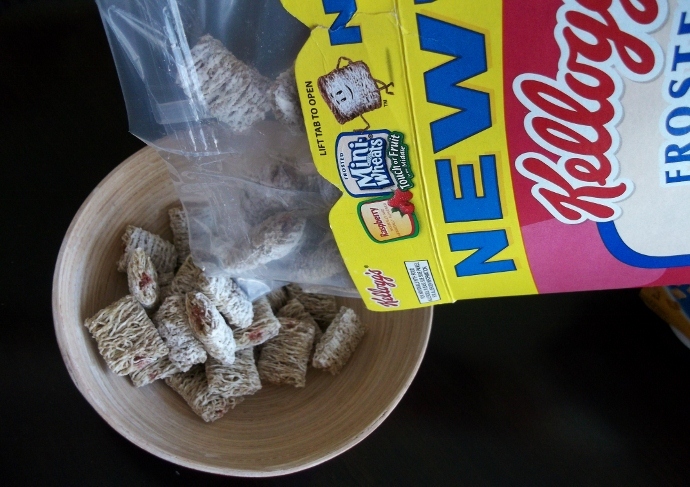 I love mini-wheats! The Marie Callendar's Brekfast Bake looks so yummy! Looks great! I actually love your tablewares! Oh I wish we had this store near us! The Breakfast Bake looks so yummy! I always love your photos. Breakfast is so important for everyone. I want that breakfast bake! Oh yum! Now I'm hungry! It looks so good! We don't have a Vons anywhere near us. I wish we had more options when it comes to grocery shopping. It looks like they provide great deals! I was hungry before looking at your post now I am really hungry. That plate of fresh made breakfast looks delicious. I actually had an experience recently where I was behind a lady at the food store who was couponing. She told me what a blessing it was to her family and how they can now afford to have better quality food and more fruits and vegetables in their diet. For me deals were always nice and I would buy something on store sale as opposed to the same product not on sale. So it was eye opening to witness just how much she spent and hear what she can now do for her family. i love the buy 4 save $4 events ! I don't really have any breakfast traditions. I shop by myself.